Many of us, at least in the U.S., can't think of tuna without thinking of Bumble Bee. It was what I brought in my school lunch for years. I enjoyed Bumble Bee tuna sandwiches and tuna salads on picnics and trips to the beach. Over the years, their products have increased to include sardines, oysters, salmon, and crab. I've probably bought just about all of their products at one time or another. Except the chicken. Because why? That's like buying Perdue salmon or Butterball oysters. But I digress. 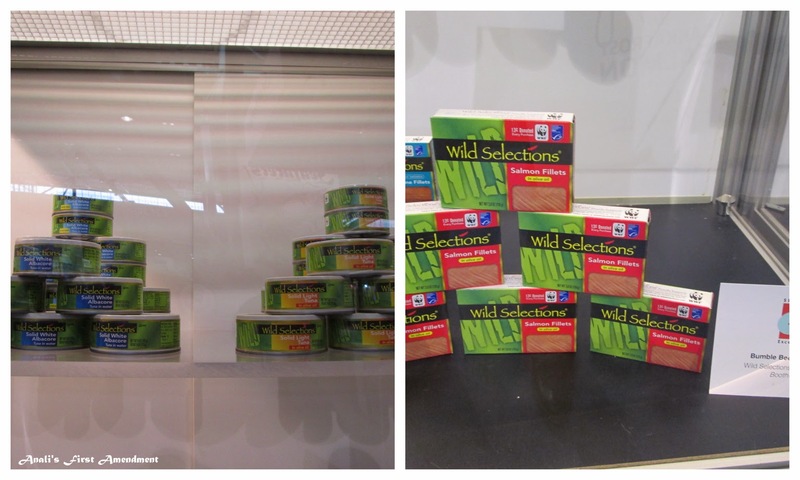 At Seafood Expo (SENA), I was surprised to see a new line of Bumble Bee products called Wild Selections. The packaging is very different from their other products and I only knew that it was Bumble Bee based on the signs next to the cans. I was and still am intrigued. The website lets you put in the numeric can code to "Trace Your Catch" and find out "where your seafood was sustainably caught." It also states that each can is certified sustainable by the Marine Stewardship Council. It seems that everyone is saying that their seafood is sustainable, but if everyone says it, then how can it be true? Who can we believe? What label certifications are the most reliable? I certainly cannot give you a definitive answer. But I can give you a simple comparison between two different organizations that give sustainable label certifications. There are probably many more organizations that give sustainable label certifications as well, but I will focus on the two that were relevant to my attendance at SENA. While at SENA, I spoke with Paolo Bray, Founder and Chief Executive Director of Friend of the Sea, another organization that provides sustainable label certifications. He's been doing this work for over 20 years and started with the Earth Island Institute Dolphin-Safe Project. The Dolphin-Safe label, may be one of the first environment related labels that many of us had ever seen. Bray says that we have to be careful of the different certification programs. He stressed that many are affiliated with the seafood industry and are not necessarily objective, but Friend of the Sea is a non-profit NGO and independent from the industry. Below is an edited excerpt about their organization from the website. Please look here to read more. Products and their origins are audited onsite by independent international certification bodies, against strict Friend of the Sea sustainability criteria. Friend of the Sea Criteria follow the FAO - Guidelines for the Ecolabelling of Fish and Fishery Products from Marine Capture Fisheries. In particular, only products from stocks which are NOT OVEREXPLOITED can be certified (Art. 30 FAO Guidelines). Here is some excerpted information about the Marine Stewardship Council (MSC) from their website with edits. Look here to see more. The MSC is an international non-profit organization committed to the values of independence, transparency, impartiality and stakeholder participation. ...We work in partnership with a number of organisations, businesses and funders around the world but are fully independent of all. So there you have it. Two different organizations with sustainable seafood labels. It's up to us as consumers to read the labels when we are in the grocery store aisles and make the best choices for ourselves that we can.